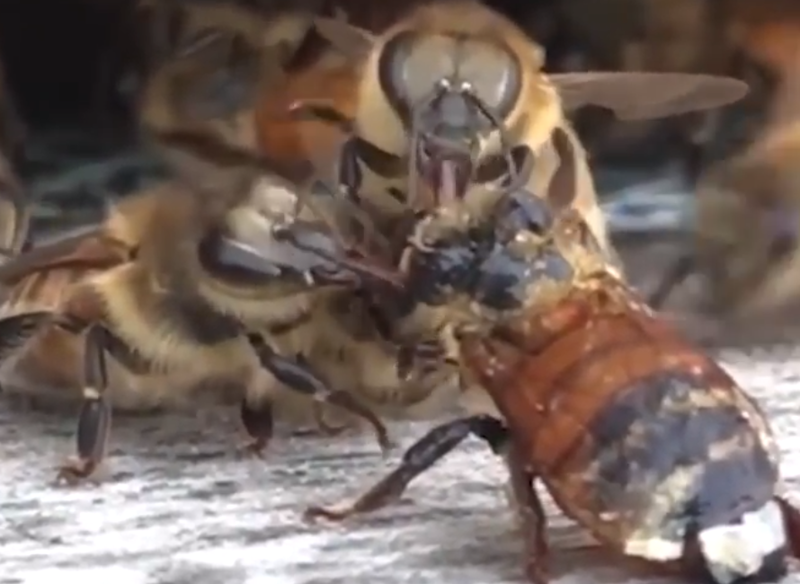 A beekeeper captured a heartwarming moment of compassion between insects when he observed an incapacitated bee falling into a honey extractor. A beekeeper captured a heartwarming moment of compassion between insects when he observed an incapacitated bee falling into a honey extractor. The poor bee became covered in honey, so the keeper moved it to the front of his beehive. As soon as the bees realized that one of their own was in danger, they started to help right away, cleaning the honey off of their mate. It took many bees half an hour to clean their friend off, but when they did, its wings were as good as new. The human perception of insects and animals is that they're emotionless creatures with no unique or distinct personalities within their species. However, new studies have demonstrated that even cockroaches have their own unique characters. Back, on July 7, 2012, a prominent international team of cognitive neuroscientists, neurophysiologists, neuroanatomists, neuropharmacologists, and computational neuroscientists gathered at the University of Cambridge in order to assess the conscious experience and related behaviors in human and non-human animals. The statement they wrote is known as The Cambridge Declaration on Consciousness. If animals can feel pain, use tools, make choices, and communicate with each other, is it that hard to imagine them as aware, complex beings with feelings and thought processes? Animals and Humans aren't the only conscious beings on this planet, though. Recent studies have discovered that plants have their own form of communication. Researchers with the University of Western Australia discovered that corn plants emit and respond to particular sounds. In their study “Towards Understanding Plant Bioacoustics,” the team discovered that when plants are played a continuous sound at 220 Hz, they grow toward the sound. This frequency range is similar to the clicking sound made by the plants themselves.